CHICAGO – In the latest HollywoodChicago.com Hookup: TV with our unique social giveaway technology, we have 60 pairs of advance-screening TV passes up for grabs to NBC’s new TV thriller “Crisis” starring Gillian Anderson (“The X-Files”)! Our winners will also be treated to a free small popcorn and soda! 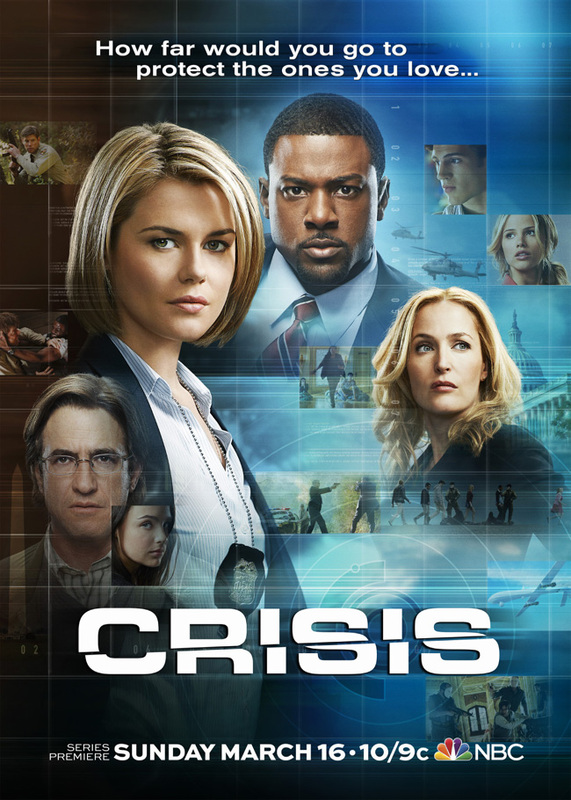 “Crisis,” which premieres on NBC on Sunday, March 16, 2014 at 9 p.m. CST, also stars Dermot Mulroney (“August: Osage County”), Lance Gross (“House of Payne”), Rachael Taylor (“666 Park Avenue”), James Lafferty (“One Tree Hill”), Max Martini (“Pacific Rim”), Halston Sage (“Neighbors”), Stevie Lynn Jones (“Runaways”), Max Schneider (“How to Rock”), Michael Beach (“Insidious: Chapter 2”) and Joshua Erenberg (“Suburgatory”). To win your free “Crisis” passes courtesy of HollywoodChicago.com, just get interactive with our unique Hookup technology below. That’s it! This advance screening is on Thursday, March 13, 2014 at 7:30 p.m. in downtown Chicago. The more social actions you complete, the more points you score and the higher yours odds of winning! Completing these social actions only increases your odds of winning; this doesn’t intensify your competition or lower your odds! HollywoodChicago.com readers: Be one of the first to see NBC’s new thriller “Crisis” with Gillian Anderson! It’s ﬁeld-trip day for the students of Ballard High: a school that educates the children of Washington, D.C.’s elite, top-of-their-industry CEOs, international diplomats, political power players and even the president’s son. But when their bus is ambushed on a secluded rural road, the teenagers and their chaperones are taken and a national crisis is ignited. With some of the country’s most powerful parents at the mercy of one vengeful mastermind, the question arises: How far would you go and what would you become to ensure your child’s safe return? With so many parents and dignitaries put into play with nowhere to turn and no one to trust, the unthinkable grows from the select families at risk to an entire nation at stake. The series was created by executive producer and writer Rand Ravich (“Life”). Far Shariat (“I Love You Phillip Morris,” “Life”) and Phillip Noyce (“The Giver,” “Salt”) also serve as executive producers. Noyce also directed the pilot. “Crisis” is a production of 20th Century Fox Television. The TV poster for NBC’s “Crisis” starring Gillian Anderson. This HollywoodChicago.com Hookup is simple! Just get interactive in our unique Hookup technology above. We will award 60 pairs of advance-screening TV tickets plus free concessions based on social entry numbers and/or randomly via e-mail for our “Crisis” Hookup. Good luck!